What is this plant called? 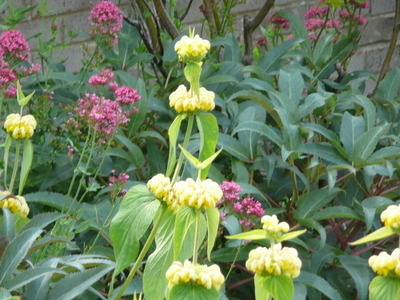 Can anyone tell me what this lovely yellow plant is called? saw this plant at Ivoire on the shores of Lake Leman in France last week, will check and come back. It was in a five centuries old garden. Think it is PHILOMIS SAMIA. saw this plant at Yvoire on the shores of Lake Leman in France last week, will check and come back. It was in a five centuries old garden. Think it is PHILOMIS SAMIA. Now please could you answer my question about browning leaves on my salix.